At twenty-five years of age, Boston-based trumpeter David Neves can’t be expected to boast a big recorded with/played with resume. But he can boast a first rate education—Berklee and the New England Conservatory. And with his Progress Report, a marvelous debut as leader, Neves blows way beyond expectations for a new kid on the block. 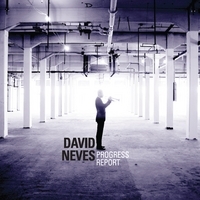 Neves offers up nine of his distinctive and engaging original compositions in the company of a group of stellar sidemen. With a continuity of mood and style, something often eschewed in debuts for the purposes of “showing everything they’ve got,” the atmosphere of Progress Report boasts a resonant and modern- sounding production polish, not unlike the two Blue Note Records discs that drummer Tony Williams offered up in the 1990s: Native Heart (1990) and Neptune (1992). And that’s not the only Tony Williams parallel. This set’s drummer, Lee Fish, is—as Davis himself described Williams—”just a mother[something].” Explosive and prodding and propulsive and incredibly subtle and nuanced when the moment calls for it. Teaming with a couple of sax men, Barclay Moffitt and Michael Thomas, a couple of pianists (who alternate tracks), guitar and bass, with a brief contribution of textural vocalese from, Naomi Gillies, Neves crafts an original take on mainstream modern jazz. The opener, “Late Night Set,” sets the tone, with a silvery sheen added by Greg Duncan’s guitar, and a band without divas, a bunch of guys who came to serve the music, Neves blowing long stretched-out lines on his solo in front of a roiling rhythm. “End of the Beginning” is beautifully arranged, with crisp interplay between the horns, with Edward Perez’ bass giving the vibe a bounce and buoyancy. “April 14, 2013” gives tenor saxophonist Barclay Moffitt a chance to step out and tell a story, before he hands it off to pianist Mathew Sheens who adds a restrained sparkle and a bit a Latin tinge to the proceedings. “Evelynn’s Song” is majestic, beautiful, with Gillies sweet vocal adding depth to the sound. Michael Thomas’ bass clarinet does the same for the title tune, the most ominous and modernistic tune on the disc. A great debut! We’ll be hearing more from David Neves.